Tel Aviv, Israel; 2Department of Biomedical Engineering; Tel-Aviv University, Tel Aviv, Israel. 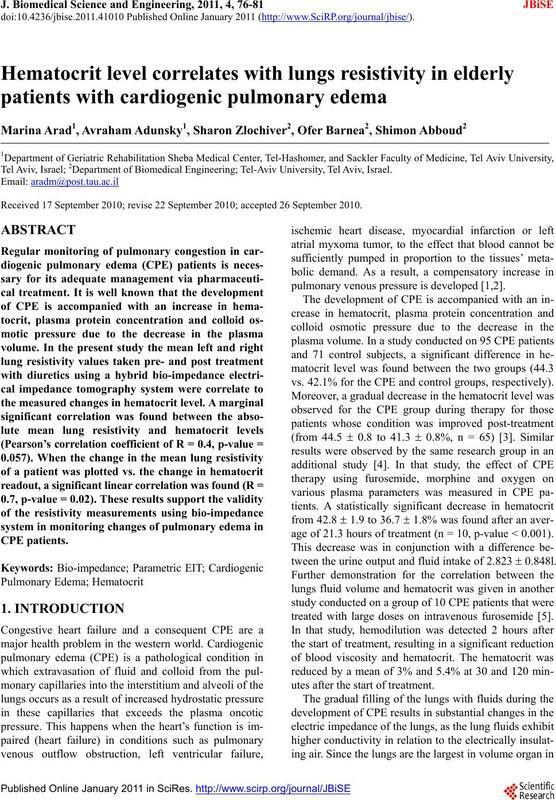 Received 17 September 2010; revise 22 September 2010; accepted 26 September 2010.
pulmonary venous pressure is developed [1,2]. vs. 42.1% for the CPE and control groups, respectively). age of 21.3 hours of treatment (n = 10, p-value < 0.001). tween the urine output and fluid intake of 2.823  0.848l. treated with large doses on intravenous furosemide . utes after the start of treatment. on the body surface via impedance measurement. 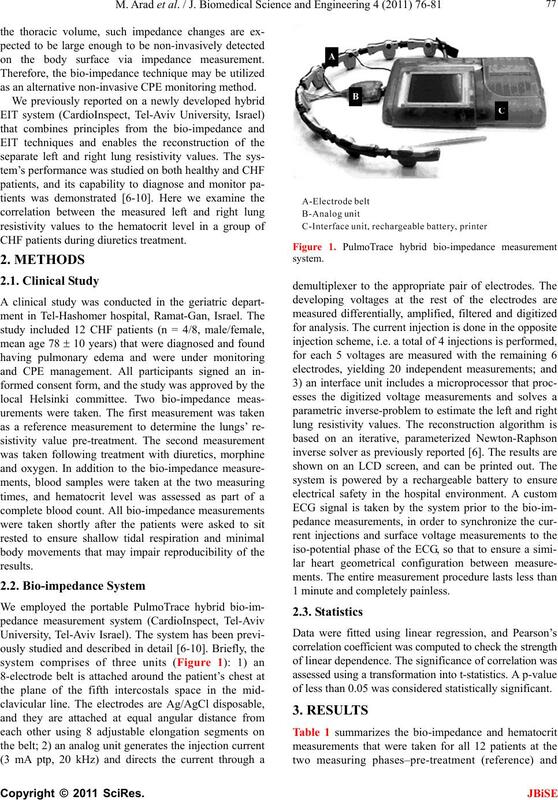 as an alternative non-invasive CPE monitoring method. CHF patients during diuretics treatment. 1 minute and completely painless. 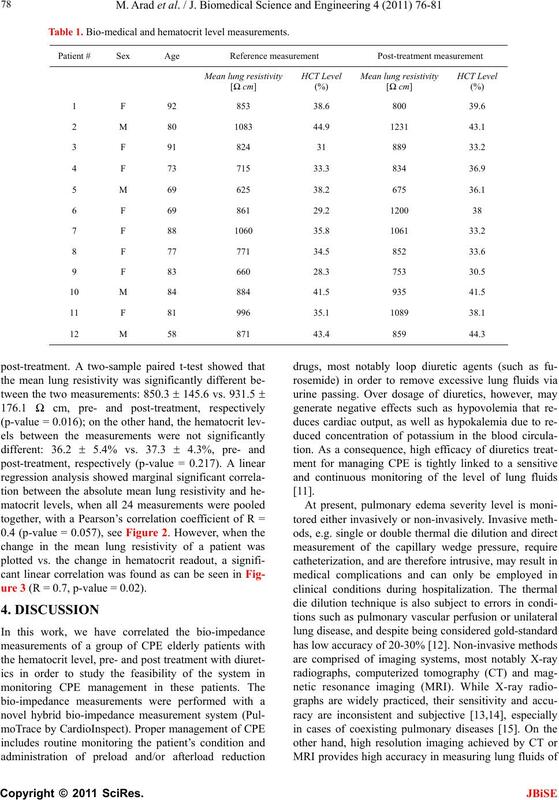 of less than 0.05 was considered statistically significant. Table 1. Bio-medical and hematocrit level measurements. ure 3 (R = 0.7, p-value = 0.02). hematocrit (n = 24, R = 0.4, p-value = 0.057). change and hematocrit change (n = 12, R = 0.7, p-value = 0.02). ionizing radiation or the large expenses involved. additional hemodynamic and cardiac parameters . 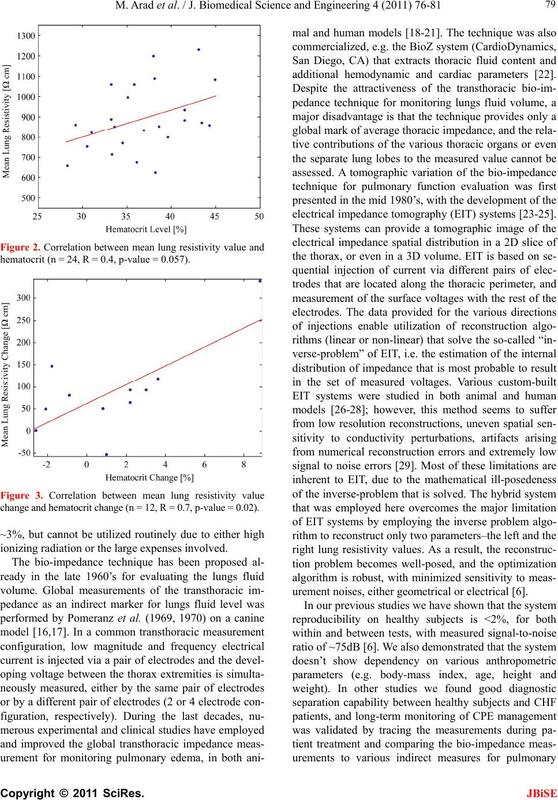 electrical impedance tomography (EIT) systems [23-25]. urement noises, either geometrical or electrical . congestion e.g. urine output  and X-ray diagnosis . urements taken pre- and post-treatment, p-value = 0.016). 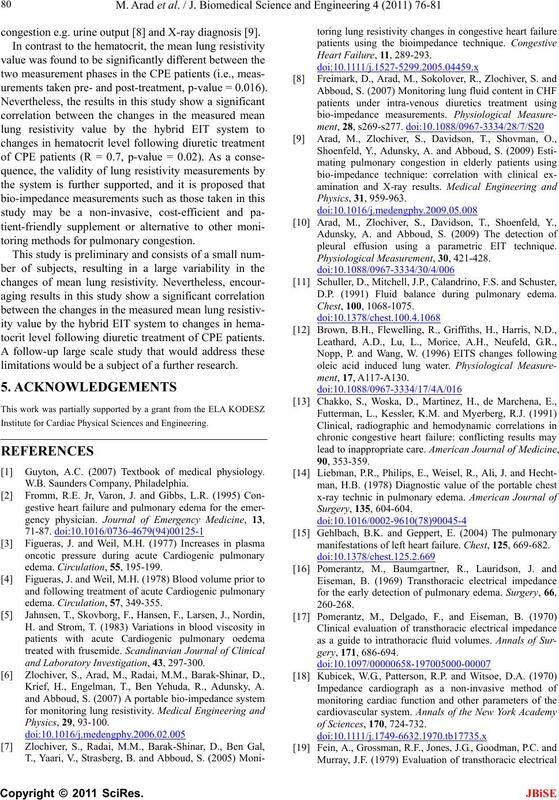 toring methods for pulmonary congestion. tocrit level following diuretic treatment of CPE patients. limitations would be a subject of a further research. Institute for Cardiac Physical Sciences and Engineering. 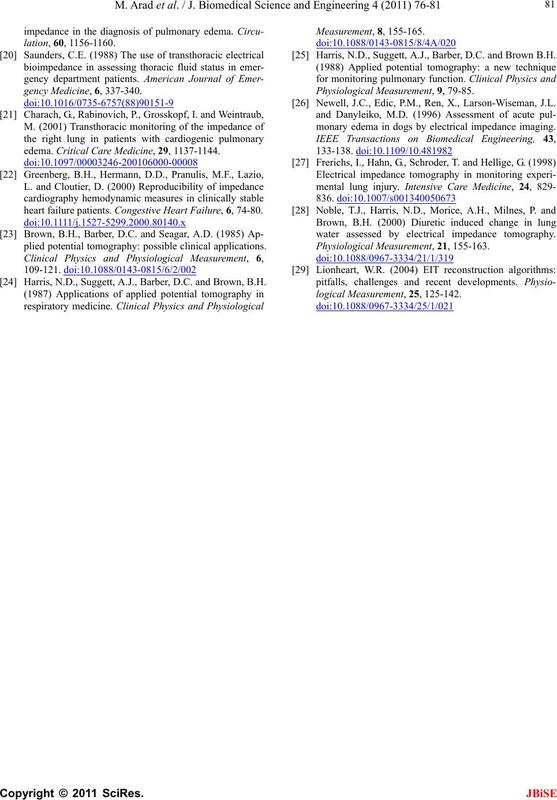 Guyton, A.C. (2007) Textbook of medical physiology. and Laboratory Investigation, 43, 297-300. Krief, H., Engelman, T., Ben Yehuda, R., Adunsky, A. Heart Failure, 11 , 289-293.
pleural effusion using a parametric EIT technique. D.P. (1991) Fluid balance during pulmonary edema. manifestations of left heart failure. Chest, 125, 669-682.
edema. Critical Care Medicine, 29, 1137-1144.
heart failure patients. Congestive Heart Failure, 6, 74-80.
plied potential tomography: possible clinical applications. Harris, N.D., Suggett, A.J., Barber, D.C. and Brown, B.H. Harris, N.D., Suggett, A.J., Barber, D.C. and Brown B.H. Newell, J.C., Edic, P.M., Ren, X., Larson-Wiseman, J.L. monary edema in dogs by electrical impedance imaging. water assessed by electrical impedance tomography.